Pokhara—Brian Kin from USA has won the tourist race organized as run for fun in Pokhara on Saturday. At the same time Alex Hoccon from UK secured 2nd position while Mykar Bakker from Canada became third in the race organized by Paschimanchal Hotel Association Pokhara (PHAP). Similarly, in separate evaluation of women, Hannah Karas from UK became the champion. At the same time, Violette Lefer from France got 2nd position and Sarah Coyne from USA became third in the race organized under the 16th Fewa New Year Festival 2076 which is undergoing at Komagane Park of Pokhara since yesterday and will be ended on Sunday. 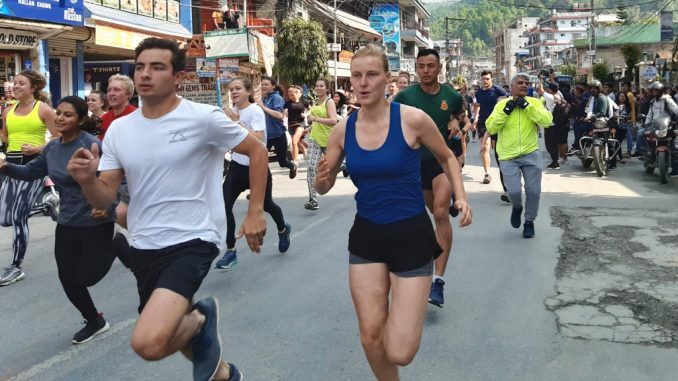 According to race coordinator Anil Singh, a total of 66 tourists took part in the competition that was held from Hotel Peace Plaza- Hallan Chowk to Ratna Mandir’s southern gate. Another race coordinator Tilak Bahadur Adhikari informed that the first prize was Pokhara-Kathmandu flight ticket form Buddha or Yeti Airlines, token of love, cocktail dinner in Busy Bee Café and massage in Seeing Hands. Runner up has bagged 30 minutes’ tandem paragliding flight facility in Annapurna or Pokhara Paragliding Company including other prizes mentioned above. The third prizes were Pokhara-Kathmandu luxury bus ticket in Greenline Tours including cocktail dinner and massage facility. PHAP chairman and festival coordinator Bikal Tulachan thanked all the participants and invitees in the concluding ceremony that was handled by PHAP general secretary Ganesh Raj Pahari.